Photos: The Sipekne’katik flag and Chief Copage. 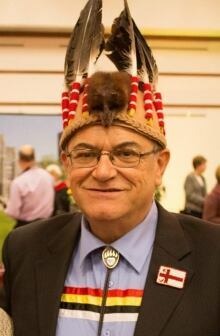 Photo of Chief Copage by CBC. The Sipekne’katik Band is opposing the decision by Colchester County council to allow fracking wastewater to be disposed of in the community of Debert's sewage system. Sipekne’katik is the second largest Mi’kmaw band in Nova Scotia with more than 2,500 members. The Chronicle Herald explains, "On Dec. 10, Colhester County issued a permit to Atlantic Industrial Services of Debert to allow the business to dispose of about 28 million litres of the water generated during test fracking of wells in Hants County by a subsidiary of Triangle Petroleum in 2007 and 2008." The farming community of Debert is located on an eastern tip of the Bay of Fundy. About 1,200 Sipekne’katik Band members live in Indian Brook First Nation, which is situated about 60 kilometres south of Debert and about 70 kilometres north of Halifax. The news report highlights, "Sipekne’katik Chief Rufus Copage said Tuesday that his First Nation has not been consulted on the planned disposal and that it is opposed to the treated water being flushed into the environment. 'We have a duty to protect our water', said Copage. The band will be appealing the decision by Colchester County, he said." In a media statement, Chief Copage says, "Sipekne’katik strongly opposes the transporting and disposal of fracking wastewater into the Debert sewer system or anywhere within Mi’kmaw territory. The protection of water is important to Sipekne’katik and stewardship of the environment is of paramount importance." The Council of Canadians stands with the Sipekne’katik in opposition to this plan to dump fracking wastewater. The public had been given until December 29 (now extended to January 12) to submit appeals to county council's decision. Colchester County's five member sewer use appeals committee will then review those comments later in January. But the Truro Daily News cautions, "To overturn the decision, any appeal would have to show that the Debert company has not met the threshold for disposal, as is set out in the municipality's sewage discharge bylaw, which would be highly unlikely given the approval granted by the public works department." That said, we've won this before. In March 2013, the county's direct of public works approved the discharge of 4.5 million litres of fracking wastewater into the sewer systems of Colchester County. But many - including the Council of Canadians - opposed this decision and by May 2013 the sewer use appeals committee had unanimously overturned that decision. In its decision, the committee declared, "it is not the role of the Municipality to allow the Bay of Fundy to be a petri dish for fracking wastewater." And we now potentially have the added element of the court-recognized duty to consult and the requirement for free, prior and informed consent. As Chief Copage notes, the Sipekne’katik oppose the dumping of fracking wastewater anywhere in Mi’kmaw territory. If you live in Colchester County, or in the wider area that would be affected by this dumping of fracking wastewater, the Council of Canadians encourages you to voice your opposition by sending your comments to the county's chief administrative officer Ramesh Ummat at rummat@colchester.ca by 12 pm AT on January 12, 2015.